We joined the race. Long back though. But in order to revive the spirit of the so-called rat race I plunged again into a foray of ‘healthy food’. So I make greens one day, sprouts the next. Give porridge for dinner to sulky faces and sell squash soup as ‘the tastiest’ thing on earth. Yes, God gave them all a good mind of their own. Who am I trying to fool? sigh! I think I am just convincing myself that if I cook healthy, my family would be far from disease, pain and suffering. Ah, well. So in those times when I go manic with my cooking, the family sorts out the yummy from the yucky. Some of the healthier stuff actually does taste good (please ask Elaine of foodbod.. she eats healthy ALL the time! I envy you Elaine 🙂 ), like this sprouts curry I made the other day. I mostly always mix all my beans/lentils to sprout. Its never only mung beans or only dew beans. A handful of mung, some dew beans(mat/moth), throw in some small black chick pea, a bit of dried white peas or anything you like! Soak overnight. Drain the water. Tie them all in a muslin cloth, sprinkle water over the tied cloth basket. Keep it for a day or two and let them germinate! You can have them raw or cooked. I go the mid way usually. Cooking them a little bit till the raw smell and taste disappears but retaining the crunch. If you want to know more about sprouts, read here. In a wok/kadai, heat oil. Splutter cumin seeds. Throw in the garlic, onions, ginger and green chilies. Saute till the onions turn translucent. Now add the tomatoes along with all the said spices. cover and cook till the oil starts to leave the sides of the wok. This may take about 10 minutes or so. Now add the sprouted lentils. sprinkle 2-3 tsp of water. Cover and cook till the sprouts are half done. I like mine not very mushy, so I add the sprouts in the end, but you could add it earlier in case you like them fully cooked. Switch the flame off. 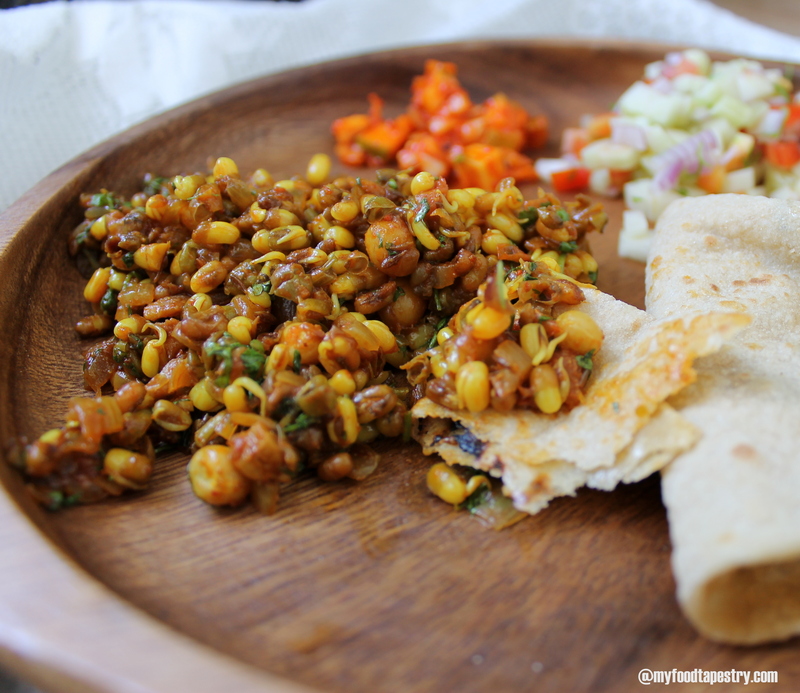 Sprinkle lime juice and garnish with coriander leaves. 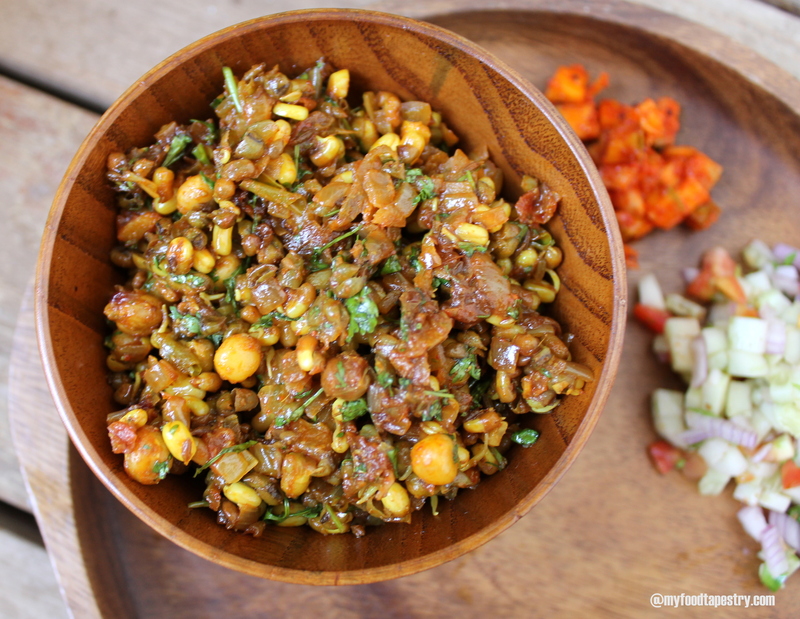 Serve as a salad or with chappathis or with any pulao or simple plain hot steaming rice. Germinated raw food does not usually suit everyone. People suffering from gastric problems can get very uncomfortable after a small bowl of sprouts. Cooking the beans is easier to digest. Oh goodness! I have never tried sprouting the mixed beans! Time now. That looks delicious Namrata :). :). I have to now :). Looks lovely, Namrata. But actually, I am admiring the chapathis. They look so soft and perfect! Oh great. Do try it. Annoying??! Why, no!! I admire that you can resist n eat healthy all the time, just that I aberrate on many occasions n then feel terribly guilty. 🙂 hav to learn to rein my taste buds n cravings!! your sprouts look perfect, and the curry delicious! I have not tried muslin cloth for sprouting, I think it would work well with high humidity like in India. Yes muslin cloth works well for India, esp Mumbai. I don’t sprout for more than a day though, coz of the intense heat they tend to smell. So we polish them off when they just start to germinate. oh really, you dont have to tie the mung beans! 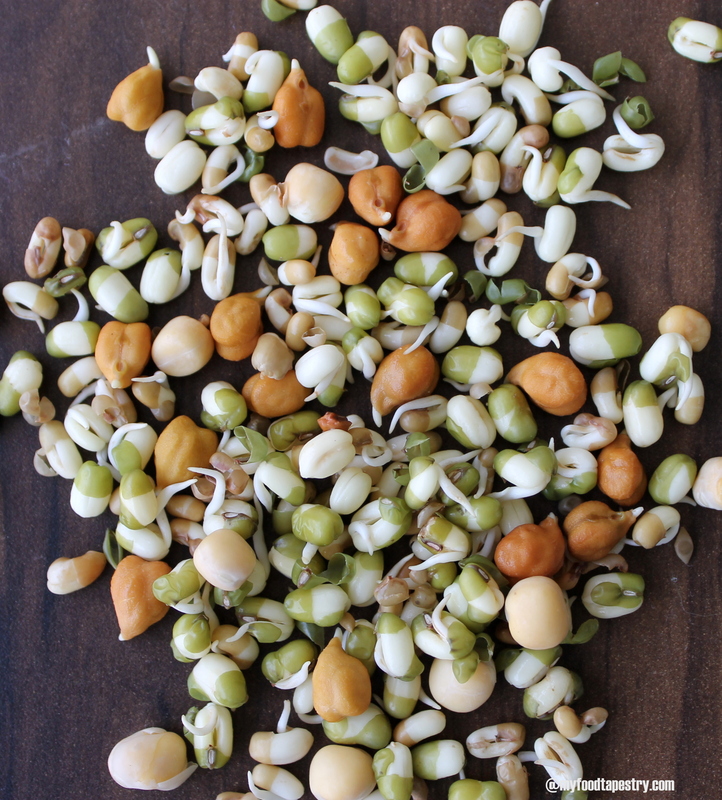 chick peas is high in protein, and sprouting them enhances the nutritional value ten fold. So yea, its a must try. Wow!!! 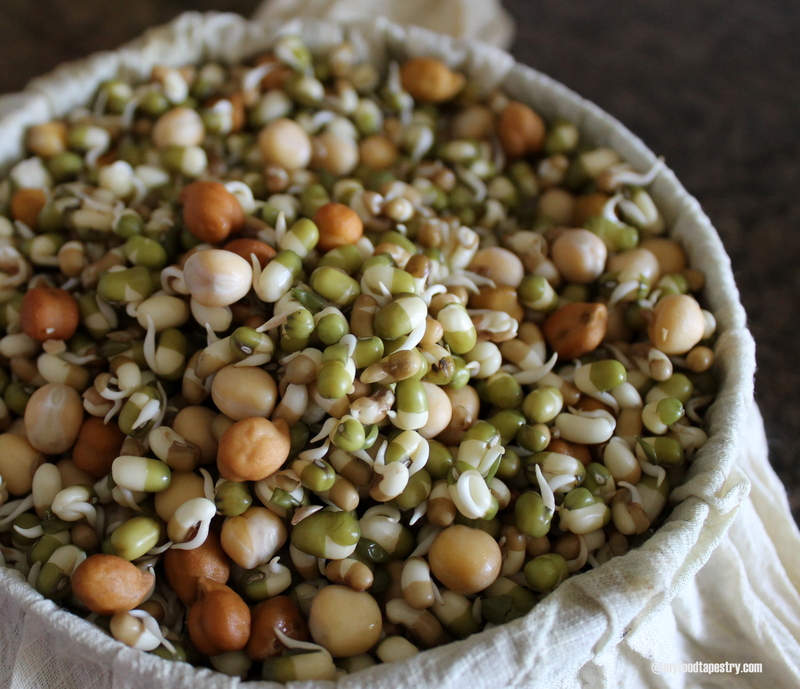 Welcome back Namrata… what a smashing post… I love this type of mixed sprouts…and as always, your pictures are smashing …. Sounds amazing – I love spouting! Hey Laura, hope youre feelin better. Sprouts is a good way to get your body back on track. They are super high in protein. I don’t like to eat raw sprouts and this is a good alternative. Not done it in a while…I am soaking some today! Thank you for reminding, Namrata! 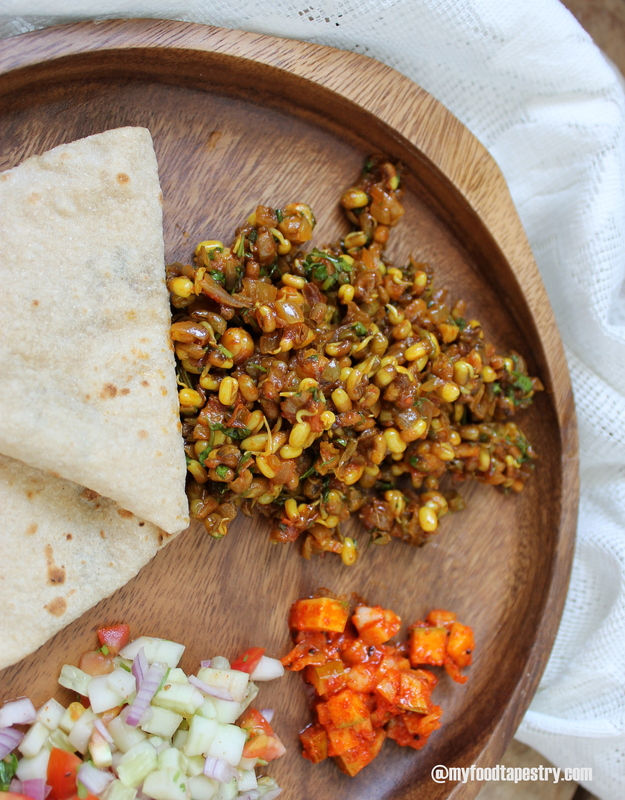 This is just so healthy, nutritious and at the same time tasty curry for roti as well as rice. 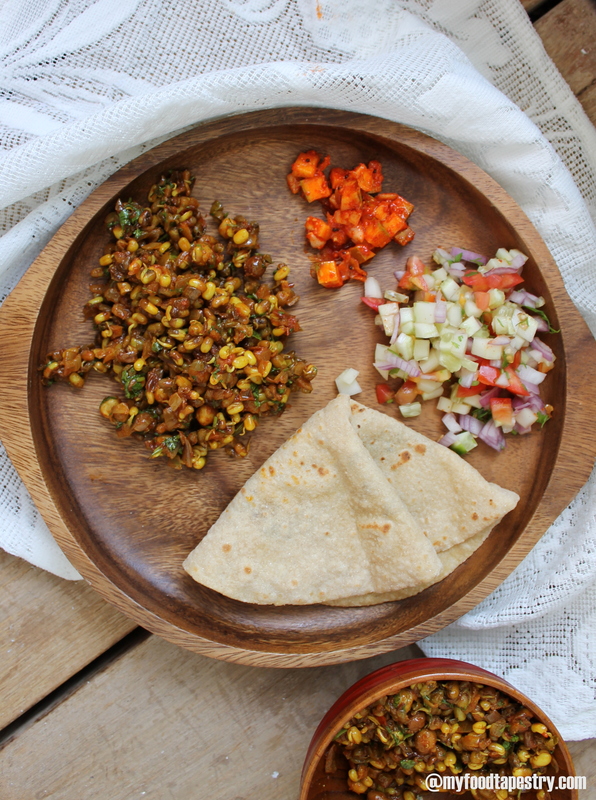 I soak the sprouts and prepare a very simple version of mixed sprouts curry without any masalas in it. This is a very different version. Ought to try! No masalas sounds fantastic! Healthier even. I am trying it next time I go soaking. Brilliant idea! I love sprout salads and curry sounds perfect! Lovely pictures..! So simple and so appetising 😃!I will try this recipe for sure! Yes simple and so nutritious!